Sometime today you'll be seeing another update to the beta builds. This will bring the version number up to v2.0.61. The full change log is provided below. Betas should now be updated. Enjoy the new batch of fixes! Thanks!! Already downloading BGEE Beta update , but BG2EE update hasnt showed up yet. The beta launch found me on the middle of my first ever BG2 playthrough (with an imported char from BGEE), so im enyoing double of it!! First for the great game it is and second for all the new great features and UI changes that keep coming! EDIT: Already downloaded BG2EE v2.0.61 !! Thank you @Dee for letting us know. Is the problem with the baldur.lua file in folders with non-Ascii characters in their path fixed with this update (I don't see it among the listed fixes)? Since BG2:EE updated itself to v2.0.61, I can't load my previously made (from v2.0.60) Legacy of Bhaal saves without the game resetting their difficulty to Insane. I got stuck at basically complete, download rate plummeted and I guess it struggled with one final file. Exiting and restarting the application fixed it. The difficulty is driven by a global in your saved game. Open your save's .GAM file, find the variable called GAMEDIFFICULTY, and set it to 7. I'm not familiar with the .GAM format, and I don't know how to change globals manually. Or should I use EEKeeper? Is that safe to use with the beta? 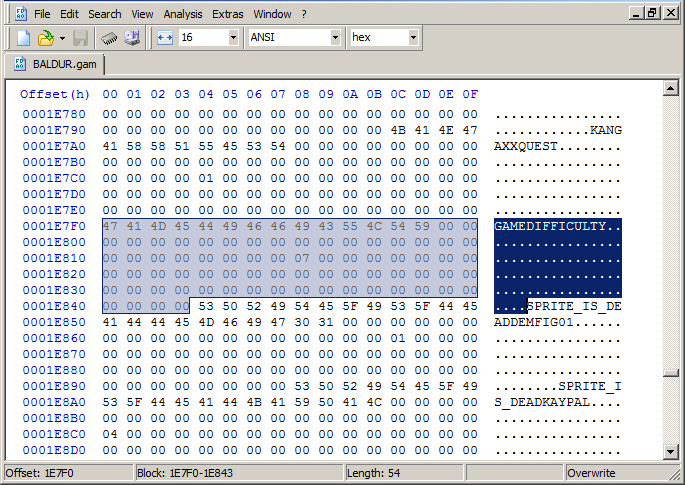 Don't use a hex editor. ... @Troodon80 ? is it safe to use EE Keeper yet? Also, I gave you the wrong variable name. The one you want to look for is BD_NIGHTMARE_MODE, and you'll want to set it to 1. Should be safe. The GAM file format hasn't really changed. That works fine for initially setting a game to nightmare mode, but v2.0.61 appears to reset the value of BD_NIGHTMARE_MODE back to zero when it saves the game file. If you save and reload, you'll no longer be in nightmare mode. The game difficulty slider will still be invisible, making it appear as if the game is still in nightmare mode. However, actual combat will show otherwise. I got roughly the same results via EE Keeper. On reload of the edited save, the options slider is gone and the game appears to be in nightmare mode, but the enemies are as weak as they are in insane. Then, when I save/reload again, nightmare mode is fully gone, BD_NIGHTMARE_MODE is back to 0, and the options slider is back in the gameplay options. Can we expect at least yet another patch release to address most irritating issues (ie: 20531, 20282, 21473, 20671 and many many other) ? We have a big batch of fixes that we're hoping to get done before the update goes live, but it likely won't make its way to beta before then. So are you saying your hoping to get a new beta patch out before the 31st with the extra fixes but its not guaranteed to make it in? If its not in by the 31st will there still be beta patches after the main release for these fixes or will they always push to live? Also on the topic of bug reports some reports I have noticed have been changed to feature request from new with comments such as "Moving this to a feature request for now.". I assume this is because your trying to focus on only the critical bugs and the minor ones your putting aside for now to avoid creating other potential bigger bugs before release? Lastly I have also noticed some submitted bugs are being changed to "Confirmed Fixed". Would it be helpful for some of us to go though and confirm our own submitted bugs with a comment if its fixed to help speed up your work. Or do all bugs still have to be tested by you internally before it can be 100% confirmed fixed. Im assuming you have to do it anyway to avoid mistakes or other problems caused by us testing it wrong but thought I would ask. As Dee has explained already (probably in another thread), Feature Request is meant for requests that request a change to existing working functionality. Don't confuse it with things their glossing over. Bugs that are actually bugs will remain listed as a bug even if their not being fixed in the next patch. Hmm curious, I see some feature requests that are defiantly bugs but I guess they can be perceived as changing existing working functionality. However for AI or balance bugs for example, where there is an unintended or unexpected behaviour. That could both be considered a bug and a change to existing functionality. As it both works in a manor that dosnt break the game in a major way if at all but at the same time still isn't achieving the expected or desired result, say compared to the original. Although im sure its more a case by case basis and priority in function that help determine it to. Likewise maybe they never considered something to be an issue until brought up and so further thought or discussion was required. @00zim00 PM me a list of tickets that you think should be bugs, and I'll give them a second look. Not fixed in 2.0.62.2. It's a rather fresh game I had started. 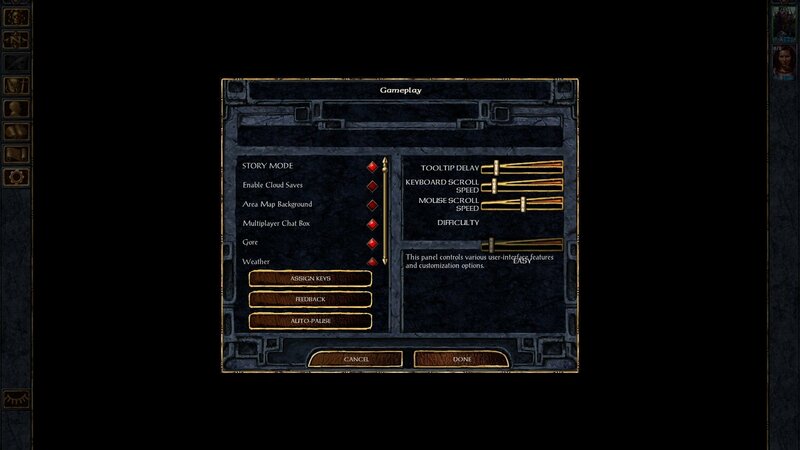 A quicksave "with Imoen" still loads fine. All later ones are reset to "Insane". I've not viewed or changed the game options, but I may have reloaded a savegame on the long way to rescueing Branwen early. What are the details of this bug? How can it be avoided while testing the beta? Is it really related to viewing/changing game options? There has been another bug where Story Mode turns on automatically upon reloading saves. Maybe it's related? Previously, there was a setting in baldur.lua for each of Nightmare Mode (Legacy of Bhaal) and Story Mode. Those settings are no longer necessary, but in order for the fix to work, you'll need to remove those settings from baldur.lua, or delete baldur.lua entirely to let the game re-populate the defaults. 5. it is reset to "Insane"
Though, even loading the TOB savegame, quicksaving it and loading the new quicksave resets to "Insane". Did you delete baldur.lua while the game was running? If so, the game will have recreated the file from the settings it already had. Try closing the game, deleting baldur.lua, and then launching the game. Do I also need to start a new game? Why does the single early savegame "with Imoen" reloads fine and is at LOB difficulty? What exactly happens that when I save/quicksave it and load the new save, it is reset?